Hello lovelies and these months are passing by way too quickly, we have had snow, sunshine, hail and everything in between this past month! On my life bucket list is to have a really good blossom tree and we now have one at both the front and the back of our home – this weekend it really started to blossom which gives me hope that sunnier days are on their way! This picture was taken this morning as we left on the way to school – look at those blue skies! First up the stats! I did put a couple of numbers in to aim for and I’m really pleased to have smashed the Instagram target as I have been spending more time on there and less on Twitter. A schedule is really what I need to share the time out and promote my blog equally on each! Last month I said we were going to get out and do more as a family and we did! Yayy! Read about our trip to the Makers Faire at Newcastle, my review of Fat Hippo which I visited with Little Miss or a birthday trip with Evie. During the month of May I would love to get some of the gardening done, since we moved the weather has been awful which means the garden is resembling a jungle right now! I’m not a keen gardener but cant wait to get out there and make a start! 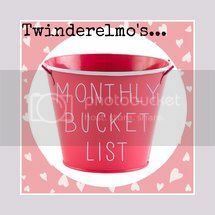 Linking up with Twinderelmo and the Monthly Bucket List challenge! #LittleLoves Week Two – 15th January 2017!